FORT LAUDERDALE, FLORIDA (May 3, 2016) - MHG Insurance Brokers, a full-service insurance brokerage serving the marine industry, businesses, and groups and individuals around the world, has been recognized as one of the Best Places to Work in South Florida by the South Florida Business Journal, a program that celebrates excellence and employee satisfaction in the workplace. Results were based on a survey evaluating ten areas of engagement, including employee benefits and recognition, leadership, turnover, employee and leadership management and more. Results of the survey were submitted to Quantum Workplace for analysis. Employees were encouraged to answer freely as all answers remain anonymous. Many of the companies in attendance had similar benefits or characteristics that made them worthy of the honor of being a Best Places to Work in South Florida. Some characteristics that made MHG stand out are its family atmosphere, excellent benefits that are 100% funded by the company, flexibility, and MHG’s entrepreneurial spirit which encourages employees to present new opportunities and initiatives for the company. Since 1991, MHG Insurance Brokers has been committed to providing expert insurance advice and innovative solutions for the marine, aviation, energy and related industries. Today, with over two decades of experience and relationships with some of the world’s top insurance markets, MHG has established an enviable reputation for providing quality advice, products and service for groups, businesses and individuals around the world. Based in Fort Lauderdale, Florida MHG has insurance specialists worldwide, with offices in Houston, Isle of Man, the Cote d’Azur and Hamburg. For more information, please visit mhginsurance.com MHG Ocean Benefits Limited, trading as MHG Ocean Benefits, MHG Insurance Brokers and MHG Underwriting Services, is registered with the Isle of Man Financial Services Authority as an insurance intermediary in respect of General Business. 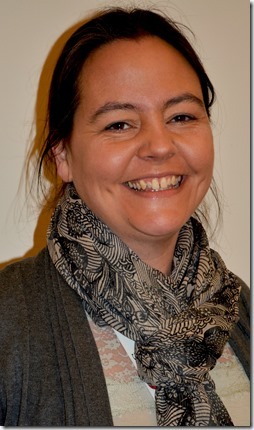 Registered in the Isle of Man, company number: 120885C. Since 1991, MHG Insurance Brokers has been committed to providing expert insurance advice and innovative solutions for the marine, aviation, energy and related industries. Are you ready to explore a tale of two cities? 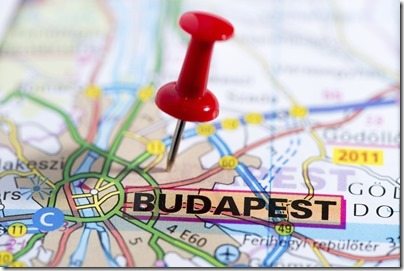 No I’m not talking about the famed Charles Dickens novel, I’m talking about Budapest, Hungary! Budapest, Hungary is a wonderful example of old world charm. 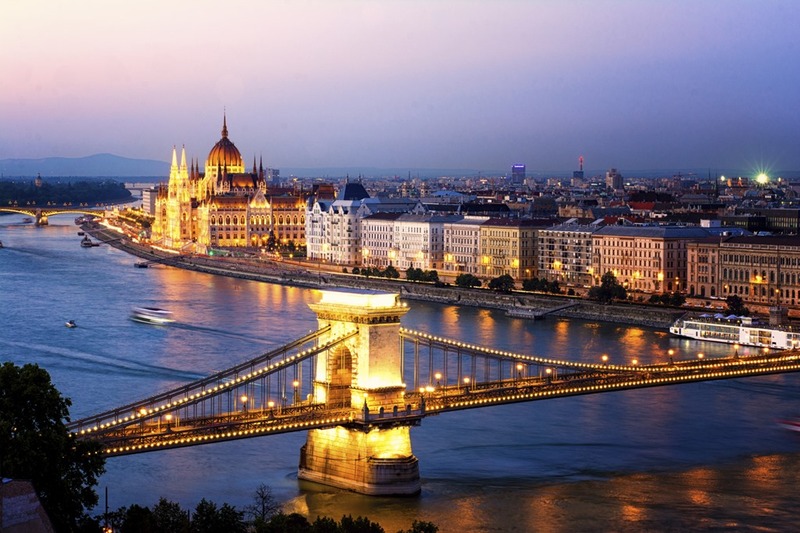 Located in the heart of Europe, the city is split down the middle by Europe’s second longest river, the Danube. One reason this city is so scenic is because Buda is on one side and Pest is on the other. 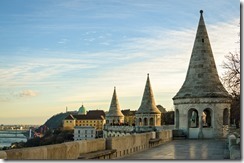 Buda has more of a “hilly” landscape and tends to be more rural. Here you can find some famous must-sees such as the Royal Castle and Fisherman’s Bastian. Pest on the other hand is more of an urban city area. It is on this side that you can find the Parliament Building which is the largest one in the world! While the two sides used to be separate, in 1873 they unified to become one of Europe’s most culturally diverse cities, Budapest. While there are obvious stops to be made while visiting this historic area, getting involved and entrenched into the culture is the best way to get the most out of your trip. Walk the streets and take in the views, visit local restaurants and cafés to taste authentic goulash or sausages, talk to a local to find out where the best spots are located, and when you are done you can relax and unwind by having a roman bath in the Gellert Hotel; the list goes on and on. For those that don’t remember, earlier this year we wrote a blog, “The Top 5 Places to Visit in 2016.” Number five on that list was Budapest, Hungary! One of the best ways to see Budapest is by taking a cruise down the river. The Danube River splits both sides of the city, and offers some of the most scenic views of the city. Many would agree that there are few better ways to sit back and relax after a day of sightseeing than by floating down the river and taking in the views. Take your pick from a plethora of different river cruises to choose from depending on what you’re looking for, from a romantic dinner cruise to a wine tasting or cocktail cruise! 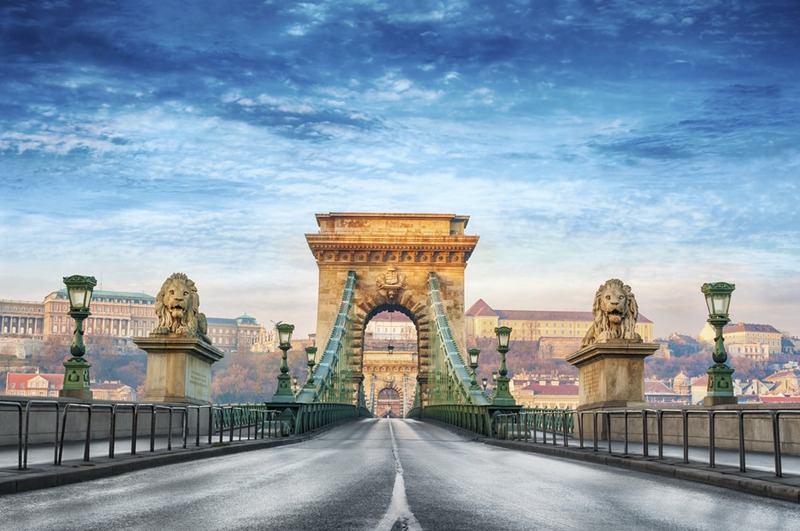 The Chain Bridge is one of the most iconic and symbolic sights to see in Budapest. 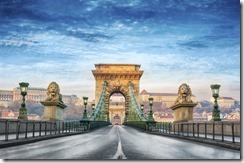 It was the first permanent stone bridge to be constructed which connected Pest and Buda. Built between 1839-1849 by William Tierney Clark, Chain Bridge has gone through a couple rebuilding periods in order to remain properly functional. The bridge is littered with photo opportunities, street vendors, and several stone statues. Try walking the bridge at night when it is all lit up for a nice romantic stroll! If you are looking to get lost in Hungarian culture, this is the place to be. The Grand Market Hall is one of the best places to find authentic Hungarian food, spices, folk, and art. That is probably because it is the oldest and largest indoor market in the city. Its architecture and design is quite unique as it is three stories tall and fit with colorful tiling, large windows, and open spaces. On the ground floor you can find everything from meats, to spices, to spirits. The second floor offers souvenir shops and eateries. And in the basement contains butcher shops and a fish market. The building is located on the Danube and is over 100 years old! Located next door to the Royal Castle and St. Stephen’s Church (who was the first king of Hungary) is the iconic Fisherman’s Bastion. This terrace was built between 1895-1902 and includes a whopping 7 towers! Part of the attraction to Fisherman’s Bastion is its location. Located on the Buda side, this terrace offers magnificent views across the Danube, most notably one of the best views of the Parliament Building. Try going here at dusk to see the lights of the Parliament Building as well as the surrounding city. 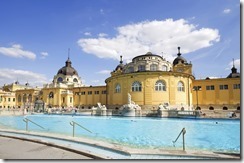 No matter what time of year you are visiting Budapest, a visit to the Szechenyi Baths should be on your itinerary. 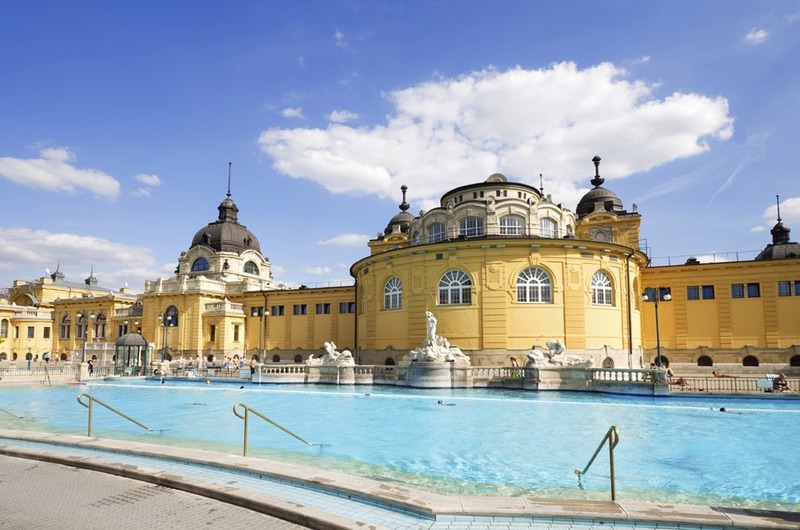 Known as the largest medicinal bath in Europe, the Szechenyi Baths are supplied water by two thermal springs below Hungary. Because of the natural chemicals in the water such as sulfate, calcium, magnesium, etc. it has been said that the waters can help degenerative joints, joint inflammation, and some orthopedic post treatments. These baths are not like anything you have ever seen, as they are from the Victorian Era with Neo-baroque styled architecture surrounding the “heated pools”. There are 18 pools in total, ranging from a large outdoor pool, to smaller indoor pools and spas all ranging in temperatures and characteristics such as different jets. Now that you have some ideas of where you should be traveling in the upcoming year, don’t forget to protect yourself by getting Travel Insurance. As stated in a previous blog, “Tips Everyone Should Follow When Traveling Abroad”, it is important to have proper travel insurance coverage in case of an unexpected emergency while traveling abroad. Our Insurance Specialists have the knowledge and experience to offer advice or help select the best insurance plan for your needs. Visit mhginsurance.com or call +1 954 828 1819 or +44 (0) 1624 678668 for help in selecting the plan that fits you best. Safe travels! So, let’s get to know the Director of our Luxury Yacht Division, Mark Bononi! Mark has been with MHG for almost 11 years. 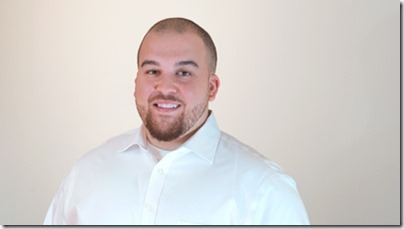 Hired in June 2005, his first position at MHG was as Account Assistant in the Cruise Division. Within a few months, he transitioned to the same position in the Luxury Yacht Division. After proving to be a valuable member of the team by going above and beyond for clients, Mark was promoted to Director of the Luxury Yacht Division, which is the position he still holds today. The Luxury Yacht Division has experienced a great deal of success under Mark’s leadership. Today, MHG insures 5 times as many yachts than when Mark originally took over several years ago. This includes over 20% of the top 200 largest yachts in the world! One of Mark’s many passions is community involvement. He is a regular volunteer at several charity and community events. We can also thank him for the Spin-a-thon, as he played a key role in helping organize the event which raises money for the Marine Industry Cares Foundation. Other organizations he continues to be involved with are Kids in Distress and Children’s Diagnostic and Treatment Center. His strong work ethic and his passion for charity and the community is one of the many reasons Mark is well respected in the marine industry and within local businesses. 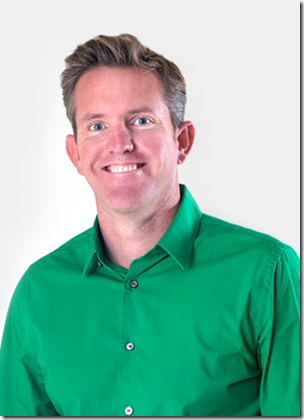 Mark was elected to USSA board of directors as membership chairman and served 6 years. Other organizations he has been associated with include International Superyacht Society, Florida Yacht Brokers Association, Marine Industry Association of South Florida, and the Fort Lauderdale Mariners Club. 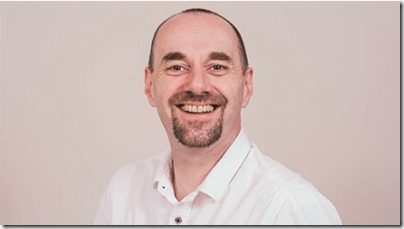 Mark is committed to customer service, and has continued to make sure clients receive the highest level of support. He is an amazing advocate for crew and is insistent on helping clients through claims. He also is passionate about educating on health insurance, which includes weekly appearances at yacht crew training schools. MHG is celebrating it's 25th anniversary! It takes a special group of people to make insurance fun, which is why you should get to know us! Almost 25 years ago, protestors in Prague, Czech Republic staged the “Velvet Revolution” which helped bring down the communist regime. Since the transition, Prague has become a top destination for those looking to experience a part of Europe that is truly one of a kind. Today, the capital of the Czech Republic is a cosmopolitan city with cozy and chic cafes serving delicious Czech foods like dumplings or fried cheese, Gothic cathedrals with architecture dating back thousands of years, and plenty of museums showcasing the incredible history of the region. Prague also is home to world famous nightlife. There are bars all around the city that you can pop into for an authentic Czech beer, or go clubbing at some of the various spots such as Cross Club or Bunkr Parukarka. For those that don’t remember, the end of last year we wrote a blog, “The Top 5 Places to Visit in 2015.” Number five on that list was Prague, Czech Republic! One of the largest castles in the world, Prague Castle can take days to fully explore and appreciate everything it has to offer. Easily the top tourist destination of Prague, it was once the seat of power for the Kings of Bohemia and Holy Roman Emperors, and is still the home of the Crown Jewels of Bohemia. Today it is the seat of power for the President of the Czech Republic. The Castle and grounds are made up of a plethora of different buildings varying in architectural styles ranging from the 10th to the 14th century. Walking through the grounds will put you right into the medieval times as you surround yourself by ancient buildings and walk along cobblestone streets. Some of the world famous buildings and attractions that make up the castle include St. Vitus Cathedral, Old Royal Palace, and St. George's Basilica. Many of the attractions warrant a visit, so plan accordingly when developing your itinerary in order to make the most of your time. Old Town square is a historic area located in the heart of Prague. The square is lined with gothic style buildings such as the Church of Our Lady before Tyn and the Church of St. Nicholas and statues such as the one of Jan Hus. A common theme throughout Prague is the historic feel from the older buildings and roads, which there are no shortage of here. One of the truly amazing attractions in the Old Town Square is Prague Orloj, an astronomical clock that was built in 1410. It is the third oldest astronomical clock in the world, and the oldest one that is still operating. Charles Bridge is a famous bridge in Prague that crosses the Vltava River. Construction began in 1357 under the order of King Charles IV. The bridge is lined with 30 Baroque statues of religious figures, totals 16 arches and is 1,700 feet long! Take a stroll along the cobblestone and experience the amazing culture of Prague, as vendors line the bridge selling hot dogs, making jewelry, and painting beautiful scenes that you will surely want to hang up on your wall at home to forever capture a breathtaking site. Prague is a very historic city, with much of its history dating back thousands of years, which is music to the ears of culture buffs looking for new experiences. With so much historic relevance from the area, it’s no wonder Prague is home to a variety of museums that should be on your itinerary. Visit the Prague Jewish Museum and learn about the Jewish heritage of the area and see some priceless artifacts of the Jewish community. If you’re looking for something unique to do, you can visit the Prague Beer Museum to do some tasting of Czech Republic Lagers. Other museums you may want to consider visiting include the National Museum, the Museum of Communism, and the Prague National Gallery. If you are looking for a break from the historic buildings and museums around the city, make sure you visit the Dancing House, or Fred and Ginger. This quirky, and unique piece of architecture has gotten a lot of attention since its construction completed in 1996. Much of it because it doesn't match or blend in to the surrounding Gothic and Baroque architecture. The building was built by Vlado Milunic and Frank Ghery, and was given the nickname Fred and Ginger by Ghery after the famous dancers Fred Astaire and Ginger Rogers because the house resembles a pair of dancers. Now that you know where your next trip will be, don’t forget to protect yourself by getting Travel Insurance. Visit mhginsurance.com or call +1 954 828 1819 or +44 (0) 1624 678668 for help in selecting the plan that fits you best. Check out our previous blog, “Tips Everyone Should Follow When Traveling Abroad,” as it is important to have proper travel insurance coverage in case of an unexpected emergency while traveling abroad. Our insurance specialists have the knowledge and experience to offer advice or help select the best insurance plan for your needs. Safe travels! It’s that time of the year! That time where everyone looks back on the past year and makes changes for the upcoming one. Whether it is taxes, budgets, even weight loss, the motto is “out with the old, in with the new!” However, you may have not originally thought to review your life insurance policy. It’s always a good idea to review any insurance policy periodically, but the end of the year brings a perfect time to look at your current policy, and see if it still offers the coverage you need. Moving always seems to bring more changes to someone's life than they originally expected. If you moved to a foreign country, there is a strong possibility that your life insurance coverage didn't follow you to your new home. Many life insurance policies are only covered in the country of purchase. However, it should be noted that there are several options for international life insurance coverage. If you would like more information on international life insurance, read our previous blog "Your Life Insurance May Not Have International Coverage". Our wellness and security is important to us. For other things to consider with the New Year right around the corner, read our previous blog, “Learn Why the Start of a New Year is Important to Your Insurance Benefits”. Whether you are purchasing life insurance for the first time, looking for better coverage or are interested in learning more about other types of insurance available to you, we can help! 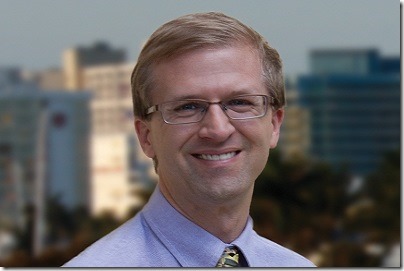 Visit our website at www.mhginsurance.com or speak with an Insurance Specialist at 954 828 1819. Don’t forget the deadline to enroll in a full-time health insurance plan is January 31st, 2016! Many people consider the "Holiday Season" their favorite time of the year. With so much going on from decorating the house, to baking treats, and getting all of your holiday shopping done in time, this time of the year can also bring some stress. Especially if you have a trip scheduled! Packing for a trip can be difficult, no matter how many times you double check to make sure you have everything, it can feel like you are still forgetting something. Going on a trip this time of year also leaves you less time to complete all of your other holiday tasks. Don’t become overwhelmed and not properly prepare for your trip, follow these tips to help get you ready to go. No matter where you are going for your holiday trip, it is important to do your research. Even if you have been there multiple times, it's important to see what the weather forecast and temperatures are expected to be. This will let you pack the proper clothing needed to stay warm, or cool. Also, it's a good idea to make a list of all the items that you need to pack. Cross off each item as you put it into the bag in order to keep track of everything and minimize your chances of forgetting something. I'm sure you have heard this saying time and time again, "Cash is king!" Carrying large amounts of cash may not always be the best idea, but going a trip is an exception. If your credit card happens to get compromised while you are away, it will be shut down leaving you with no other way to pay for things. Also, there is a chance that some places you are going don't accept credit cards. Don't take a chance and find yourself stranded in a foreign place. If traveling on an airplane, there are certain items that should be put in your carry-on bag. Any breakables you are taking should be kept with you at all times. Also, your toiletries should be put in your carry-on luggage in case you need to freshen up at the airport. Most importantly, any prescriptions you have or medications you are taking should be kept in your carry-on. In the event that your luggage is lost, you will still have the medicine you need. Whenever you are packing for a trip, saving space is a must. There are several different tips to help you get the most out of your luggage. Try rolling your t-shirts instead of folding them. Also, you can stick rolled up clothing inside your shoes. If you have any large jackets, it may be a good idea to wear them or carry them so they don't take up space in your suitcase. If you are going on a holiday trip to see family or friends, there is a good chance that you will be traveling with gifts. Depending on the gift, it may be better to ship the gift to your destination separately. Or you can plan ahead by only getting small presents that you know will be able to fit in your luggage. Be sure to leave space in your bag for any souvenirs that you may buy, or gifts that you may receive. Before setting off on your next adventure, call MHG Insurance Brokers at +1 954-828-1819 or +44 (0) 1624 678668 or visit us online at mhginsurance.com to obtain trip cancellation and travel insurance, along with other insurance plans that will make your trip an exciting, hassle-free experience! MHG Insurance Brokers hopes that you arrive and return safe and sound. For more holiday travel tips, read our previous blog, "Save Time and Money with These Holiday Travel Tips". Happy Holidays! Packing for a trip can be difficult, especially during the holiday season. Follow these tips to help get you ready to go.